American Pit Bull Terrier Dogs - The American Pit Bull Terrier is a breed of dog in the terrier group, one of several breeds loosely classified as pit bulls. Dogs of this breed are known for their strength, loyalty, and "gameness" (tenacity). Ownership of American Pit Bull Terriers is controversial, due to a well publicized series of attacks by dogs considered to be of this breed over the last few decades. These attacks have led to the ownership of American Pit Bull Terriers and "pit bulls" in general being restricted or banned in many parts of the world. 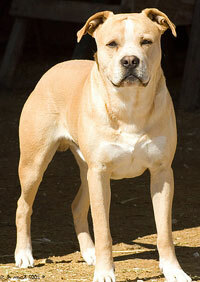 The American Pit Bull Terrier is not recognized by the American Kennel Club. It is, however, recognized by the United Kennel Club. This information is licensed under the GNU Free Documentation License. It uses material from the American Pit Bull Terrier article on Wikipedia.org. American Pit Bull Terrier Breeders - Advertise your kennel puppies and dogs here.